Walking on stage with the help of a cane, the former Genesis frontman opened his set with the classic 'Another Day in Paradise'. But the singer explained the performance would be different after his recent tumble and he would have to remain seated. "Good evening Dublin, good evening Ireland in general. I have said many times before that I would stop doing this - concerts, tours in general. But I'm here because I missed you," he told the crowd. "I have to do this concert sitting down though. I am, as you might say, f***ed." Earlier, rock royalty Debbie Harry strutted on the stage in silver runners to match her platinum hair and a T-shirt emblazoned with the slogan 'Stop f***ing the planet'. Blondie kicked off their set with 'One Way Or Another', before ploughing through their hits 'Call Me', 'Heart of Glass' and 'Maria'. Earlier, Mike and the Mechanics helped warm up the eager crowd with throwback hits such as 'Over My Shoulder'. But the night belonged to Phil on his aptly named 'Not Dead Yet' tour. Dublin always had a soft spot for the follicly challenged singer and he didn't disappoint. Helped in no small part by an epic 12-piece band, Phil belted out singalong hit after hit. A montage of videos from his lengthy career played in the background, just in case the crowd ever doubted how huge he was...and still is. Original Genesis member Daryl Stuermer also joined the impressive line-up. But the star of the band was Phil's 16-year-old son Nicholas, wearing an Irish soccer jersey with 'Collins' on the back, who ripped up the drums like his dad. When the crowd burst into 'Olé, olé, olé', Phil said "don't encourage him". The two went on to duet on the piano. With a catalogue of epic tunes, a daughter making her mark in Hollywood and a son who has just as much musical talent as his father, it's clear the Collins legacy is safe. 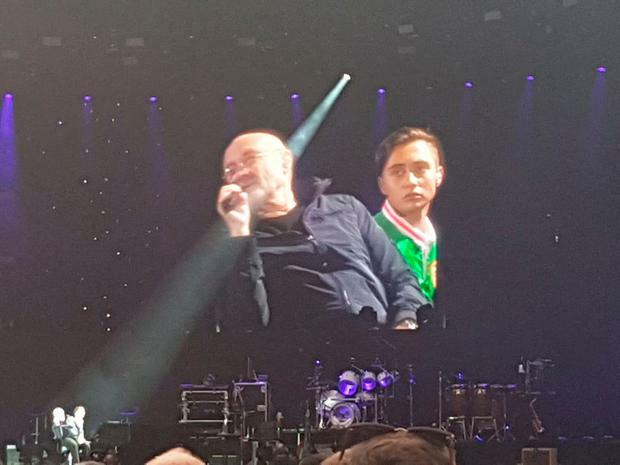 Word can't describe how good phil Collins was last night @AVIVAStadium #PhilCollins. Phil Collins son (16) rockin it out with his dad @ the aviva!